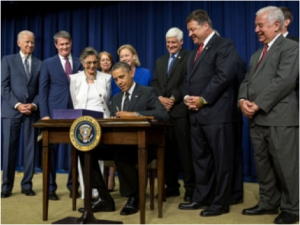 President Obama signed the Water Resources Reform and Development Act (WRRDA) into law on June 10, 2014. WRRDA enacts significant reforms including a review of current federal project delivery processes, an evaluation of the opportunity to successfully secure private capital investment in much needed waterway infrastructure improvements, and the formulation and launch of a Water Infrastructure Public-Private Partnership Pilot Program. In anticipation of the new challenges and opportunities reform driven legislation presents, The Horinko Group, on behalf of the U.S. Soybean Export Council and in collaboration with the Soy Transportation Coalition, developed the recently released report, entitled Proposed Public–Private Partnership Projects for U.S. Inland Waterways Infrastructure Financing, Operations, and Governance. The report examines the case for an alternative financing strategy to encourage greater private participation in the operations, repair, and maintenance of the inland waterway system. THG’s effort reviews the existing financing mechanisms, funding levels, operating practices, and governance arrangement and explores practical solutions offered by public–private partnerships (P3s). This analysis, funded by the National Soybean Checkoff program, should contribute to informing and shaping the Non-Federal Project Implementation Pilot Program provisions of WRRDA. The report provides a regional perspective focused on a critical segment of the inland waterway system. The contribution of locks on the lower Illinois River and the Upper Mississippi River to agricultural interests, including soybean growers-exporters, is well documented and central to the report’s findings and recommendations. To read the THG press release, visit http://bit.ly/1jRgPUc. To read the full report, visit http://bit.ly/1x8kqHu.